Open Soil: Research on the secret ingredients that make plants happy. Let’s explore what is going on in the ground beneath our feet. Let’s dig deeper together. Your contribution to a soil solution! We are happy to announce that our wemakeit campaign “HUMUS.Sapiens | Open Soil Research” has been successful! What a nice collaboration with Julian (Mikrobiomik.org) and Maya Minder (Gasthaus: Fermentation and Bacteria) to get this rolling. 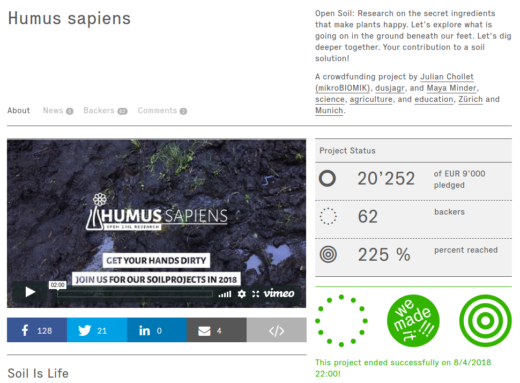 Find out more about our aims and open soil research on the website of Mikrobiomik.org. As a first activity we have the RandeLab Soil Retreat coming up 4-6. May 2018 in Schaffhausen, Switzerland, aimed at the development of DIY methodologies and workshop concepts. In July we will put these methods into action with the participants of the first mikroBIOMIK workshop weekend in the woods near Munich. i am very very interested in this project. how do i get involved please marc? are there known good senors to use to test for soil health/corruption? any open softwarez?